Along with many others on that sale viewing day back in May 2000, my family and I emerged through the house on to a south-facing narrow patio at the back and gasped, jaws dropping, as we beheld a wonderful view of the Itchen valley and the western end of the South Downs beyond. The house would need extensive restoration but the ornamental garden, such as there was – literally just two thin beds of golden rod – was the proverbial blank canvas and just what we were looking for. With 7 acres of meadow and an adjoining nut wood and orchard with 300 year old oaks, The Down House, in Itchen Abbas near Winchester, had to be ours. The original house dated from the 1930s when farm workers from the Avington Park estate built a series of houses along the road through Itchen Abbas on parcels of land that had been part of the estate and sold off in the 19th century ( to settle tax liabilities or gambling debts, depending on who you believe ). The property is bounded on its southern side by the Pilgrims’ Way, the ancient right of way from Winchester to Canterbury and always a very popular route with walkers who love this part of the Hampshire countryside. Indeed in many parts of the garden there are now ‘borrowed views’ of the Downs and the Itchen valley, allowing visitors to stop and gaze at the landscape beyond the garden. After moving in we started to restore the house giving it an Arts and Crafts feel which we wanted to extend into the garden as we started on its creation. We had a number of sources of inspiration – Thomas Mawson’s early 20th Century treatise on ‘The Art and Craft of Garden Making’, Ros Wallinger’s book ‘Gertrude Jekyll’s Lost Garden’ about the restoration of her garden at Upton Grey and Vita Sackville-West’s writings about Sissinghurst, in particular her strong sense of creating major axes through a garden that both guide the eye and the visitor. 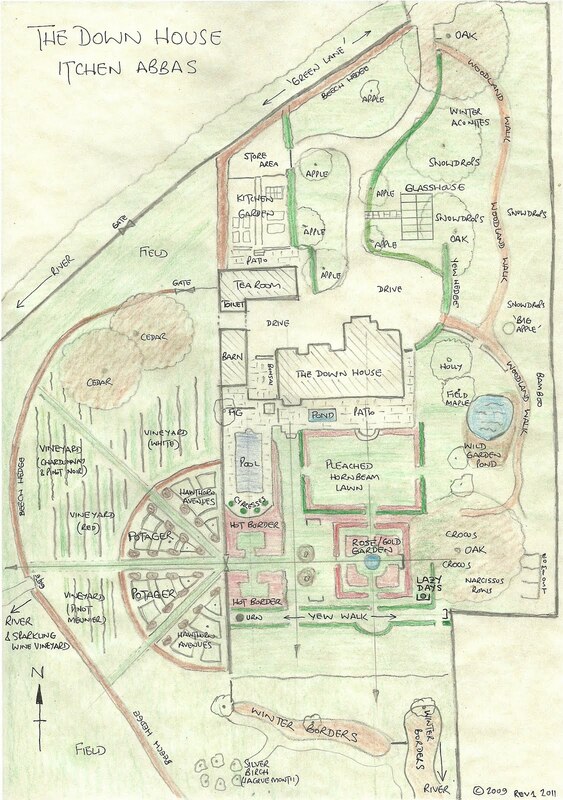 Drawing on these sources we set about designing a garden that graduated from formality next to the house to open path-mown meadows with the garden extending towards the River Itchen and bringing the woodland into the overall feel of the garden. Another key design feature was that there should always be something of interest to see in the garden at all times of the year and to create a feeling of relaxed welcome, drawing the visitor on at every turn and through every opening, encouraging the garden to be explored. While the building work was starting we were delighted to find a host of snowdrops and winter aconites emerging in a nut and apple orchard wood next to the house during the early months of 2001. These were soon followed by a large swathe of Crocus tommasinianus and so we decided to create a meandering log-lined woodland walk right through the wood in order to see the bulbs at close hand. It was when some friends suggested we opened the garden to the public to come and see the bulbs to raise money for a cancer charity that the whole idea of the garden potentially being worthy of opening under the National Garden Scheme (NGS) arose. To add further interest to the attraction of the bulbs, a winter stem border was created comprising a number of dogwood species – Cornus alba ‘Sibirica’ (red), C.alba ‘Kesselringii’ (purple/black), C.sericea ‘Flaviramea’ (yellow/green), C.sanguinea ‘Midwinter Fire’ (coral pink/red) together with the tall willow Salix alba ‘Britzensis’ (orange). When seen with the late afternoon winter sun behind the onlooker, the border looks like it is on fire with burning stems of vivid colour. An additional winter border was recently added, planted in waves of primarily willow species ( Salix alba ‘Chermesina’ (scarlet), S.nigricans (black), S.fragilis ‘Decipiens’ (white), S.alba var.Vitellina (gold), S.daphnoides (purple), S.triandra (black). Gertrude Jekyll was often fond of growing climbing roses up and through thick swagged ropes and also dividing a large sloping area with stone walls. The next area of the garden to be started then was the ‘rope garden’ where we introduced a dry-stone wall to create a lower level, enclosed garden, dropping down from the main lawn, using Purbeck stone from the old patio next to the house. The rope came from a chandlers in Southampton and is 3” in diameter and will hopefully last for years. This is our summer garden, the planting being predominantly yellow/gold and ruby/magenta with Cornus alba ‘Aurea’, Weigela ‘Rubidor’, Alchemilla mollis and Cupressus macrocarpa ‘Goldcrest’ standards really standing out against the backdrop of Cornus hedges. northern Germany the vineyard now produces over 150 bottles annually. The most recent addition to the garden is a large potager. Using a framework of avenues of hawthorn standards (Paul’s Double Scarlet) inside a semi-circle of native hedging, this ornamental kitchen garden has been planted with U-cordon apples, step-over pears, standard roses and a variety of alliums and iris edged with box. A whole variety of boldly-coloured vegetables, herbs and flowers are now growing in the 16 beds ( red onions, beet leaves, curly lettuce, artichokes, runner beans, many types of squash, dwarf purple French beans, Borlotti beans, green climbing French beans, red drumhead cabbages, purple sprouting broccoli, rhubarb chard, Swiss chard, broad beans, sugar snap peas, dark red kale (Rubidor), Cavolo nero kale, courgettes, leeks, red orach and purple Brussels sprouts together with marigolds, nasturtiums and sweet peas. After a successful accreditation inspection of the garden by the Hampshire County Organiser and her team, we opened the garden to the public in the summer of 2009 – and had 380 visitors at our first Sunday opening! Despite the obviously huge amount of work that goes into an NGS opening we get enormous enjoyment from meeting and talking to the people that come to see our garden. And we learn a lot from them too – like the lady who told me to ‘scrub my birches’ to give them that amazing bright white gleam on the trunk and branches of our Jacquemontii stands. The money raised goes to the NGS and also to PCaSO, the prostate cancer charity, the one that started us on the Open Day journey all those years ago when just a few people come to see the snowdrops. How things have moved on in such a short time. We like to feel that in creating our garden we are also guardians of a part of Hampshire’s woodland and meadow landscape that is ever evolving and is in keeping and in sympathy with its surroundings and one that creates enjoyment and interest for others as well as ourselves.